Columbia Records (Sony Music) has released a cool app for Bob Dylan official bootleg albums. The bootlegged version of Bob Dylan and The Band on The Basement Tapes, called “The Great White Wonder, started the bootleg phenomenon in 1969. Since then, Columbia has released 10 official albums of Bob Dylan bootlegs. Updates are noted below. Think of the app as computerized liner notes. Columbia indicates they intend to issue versions for all 10 of Bob Dylan’s official bootlegs. Admittedly Dylan fans are the audience for the app, but there are tens of millions of Dylan fans. Another Self-Portrait is at #15 on the Billboard Folk Charts after 7 weeks, and #49 on Amazon.com where it opened at #1. Not bad for a release of 40-year-old outtakes. The “official interactive experience” allow you to explore the histories and potentially the hidden meanings behind the songs on Another Self-Portrait, recorded between 1969 and 1971. Diehard fans and new listeners alike can watch each track unfold to a scrolling visual mosaics of the songs along with multi-media for the 35 songs. If you bought the Deluxe version with the Isle of Wight concert, it treats the concert as one song and the content is, well, shallow. Bob Dylan Bootleg App – songs get the detailed treatment – artists on the track, track sound wave, notes, lyrics, videos, pictures. The app is free but you need an iPhone or iPad 2 to play the app and MP3 copies of the songs. 1st Update – the developer MyPlay told me in an email they play to ship and Android version in Q1-2014. Windows 8 plans are indefinite. If you don’t have the songs, the app will stop after the first song is demoed. It does not matter if you bought the music from iTunes, Xbox Music or Nokia Music. I’m not sure if ripped MP3s from a CD or download from another source like Amazon.com will be accepted by the app. If you have problems, email support at [email protected]. If you have problems with song recognition, it may be the meta data is not the same as in the iTunes library. The tracks, album name and artists name must be identical to the iTunes library. If not you can edit the meta data with a program like MusicBee. What’s in the Bob Dylan Bootlegs app? The multi-media content includes video interviews with Al Kooper keyboardist and producer, Dave Bromberg a guitar player who backed Dylan, on the CD, and dozens of other folk musicians during the 60s and 70s, and Dylan producer Bob Johnston. Al Kooper is the genius, or as he would call himself, lucky musician who invented the little five note organ riff for “Like A Rolling Stone.” It was guts and serendipity that allowed Kooper to fake his way onto the record with a “great organ part.” When Dylan listened to the track on the studio monitors he said “Turn the organ up” and so Al Kooper became part of rock and roll history. Kooper, once a part of Blood Sweat and Tears, has a lot to say about Bob Dylan and that era because he was there. Dave Bromberg was a popular guitar and multi-instrumentalist in the studio and on the road. He backed Dylan, Willie Nelson, Jerry Jeff Walker (“Mr. Bojangles”), Jerry Garcia and a host of other great artists. 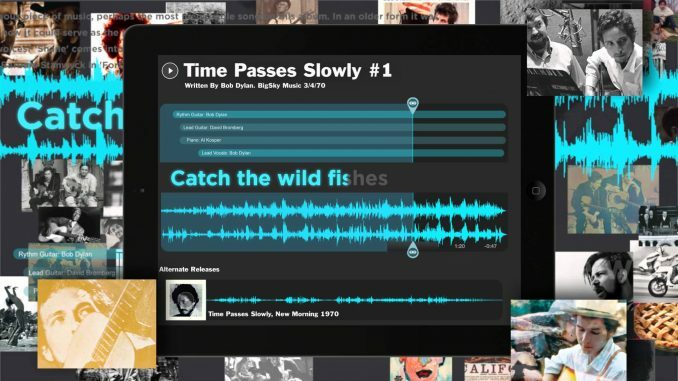 Each song gets a visual timeline, the real soundtrack (think SoundCloud animation), scrolling lyrics, a photo gallery, background info from common sources like Wikipedia. Playing the app takes several sessions, more than twice the length of the 53 songs. The app lacks a good index to remember where you were or jump to the last session. First, the 4” iPhone screen is too tiny for extended viewing. There are several hours of material, including 35 songs to listen to, videos to watch, pages and pictures. Ideally, you should be able watch it on TV using a cable or air-play. I asked the developer if the app is AirPlay compatible but didn’t get a response. 2nd Update – iOS AirPlay is on the product roadmap but not currently supported. If they had the app on Windows 8.1 tablets, all people need to do is plug the tablet into the TV with an HDMI cable and it would scale up to about 60&Prime. The app is designed for the iPad but it would not work on my iPad. It requires iOS 6.0 or later. Apple builds guaranteed obsolescence into their gear. They stopped upgrading original iPads last year. Somehow it’s compatible with iPod Touch. The days when Apple was the only name in smartphones and tablets are over. So why did Columbia/Sony release it only on iPhone/iPad? Gartner just released the data for mobile and computers and Apple is like # 3 this year. Android will be on 879,000 new devices in 2013, Windows 8 on 330,000 and Apple on 270,000. 1st Update – Android (potentially Q1 2014) and Windows 8 (no plans at this time). OK Bob Dylan fans, go to the Apple Store and buy something you don’t need to play this app. The whole app idea is passé anyways. Apps limit you to one box not any box. This app takes 380MB on your portable device. All 10 Bob Dylan bootlegs will take a 1/2 ton truck load of 4 GB of storage. Why not create the same thing on a HTML5 website and stream the content off the cloud? No doubt Apple paid something to keep the app Apple-only. Nothing will stop the inevitable growth of Android and Windows 8 and Columbia/Sony is cutting themselves out of markets they should be in.